My Nintendo, always good for a laugh. It's had its traditional start-of-the-month update with new rewards, and as always it's a mix of discounts and one virtual goodie. We already covered the North American update, so we've popped onto the EU equivalent of the site. It's actually a little more generous in the latter territory, with a Fire Emblem theme - likely in honour of Fire Emblem Heroes - driving the update. Also of note, the My Nintendo site now has a faded out menu for Nintendo Switch rewards, which are 'coming soon'. So there you have it - anything tempting there? Would say super mario run but still waiting, any news when it's realeased this month? 140 coins for 30% off TMS? What a joke. Buying the thing at full price only nets you 70 coins. @CrazedCavalier 4 Fire Emblem games. 2 virtual console, 1 3DS and the tokyo mirage game on the wiiu. I just bought Fire Emblem Awakening a few weeks ago for £31.99 and thought that was a bargain. But now it's £27.99. Damn. Buy Tokyo mirage sessions guys. It looks silly but gameplay , especially in battle is awesome.this Will become a massive cult hit when wii u is considerd retro. Meh! I'm really dissapointed with the My Nintendo rewards. I like the discounts and all that but i'll like to see some themes or games at least every two months or something. I hate to remember that i missed "WarioWare Touched" to grab the Zelda Picross game and they still don't change that game from the My Nintendo rewards. BTW i just have finished "Fire Emblem: Shadow Dragon". What a good game. Now i'm moving to play "Fire Emblem: New Mystery of the Emblem"
100 gold coins for %30 off Awakening. Will this game ever get a discount for everyone? Well, there may be some hope... Switch rewards, you say? Miitomo is also getting some Switch items. Wonder why they never used that FE artwork that was datamined. Thought that would be a wallpaper for sure. I'm still hoping that My Nintendo gets better when the Switch hits. There's also a BOTW mini-guidebook available for 10 gold coins. It gives you PDF access to the first chapter of the full guide. I'll get Shadow Dragon at that price! In 2 months my gold coins will expire. 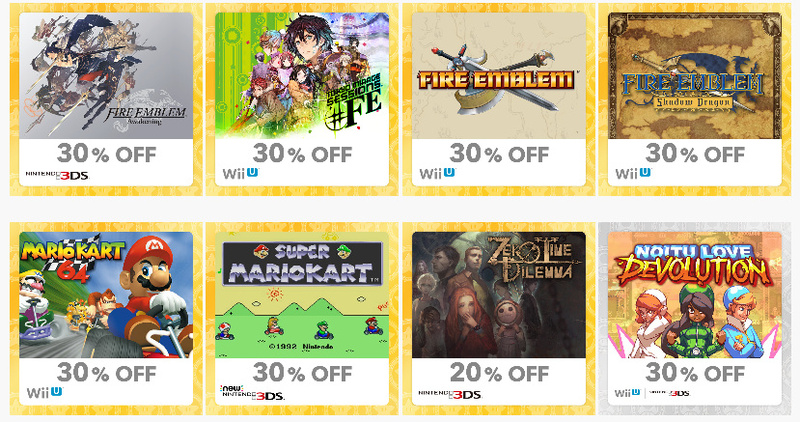 Nintendo please put full games back on instead of discounts of games i already have. 'with a Fire Emblem theme' got me excited that there was a 3DS theme. Lames. Japan also recently got some Fire Emblem discounts, i think 30% off almost all VC games, (I think one or two GBA ones on Wii U and the SNES ones on new 3DS) ended up getting Mystery of the Emblem since it was the only one I didn't have at the time. I was holding off buying my Zelda note download code from Amazon in case any deals appeared on my Nintendo (wishful thinking I know) guess I can just order it now! Rip-off con job. I bought those Fire Emblem VC games when they were on sale, 50% off. So they were cheaper and I didn't need a My Nintendo discount. WHAT!? I've been waiting to get Fire Emblem Awakening for less than $40 (which it should've been put on Nintendo Selects a LONG time ago) and there's a discount in My Nintendo in Europe but not North America? Super Mario Kart and the 3rd party games for me. Hooray for something to spend my points on for a change! I'd get Wario Kart 64 if I could have it on the Switch too. I am so used to Sony's Flash Sales for PS4 that when I look at the "deals" Nintendo offers, it just makes me sad.